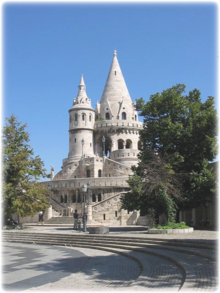 Additional Info: One of the world's most beautiful capital cities:Budapest, the "Pearl of the Danube". You can visit 2000-year-old Roman ruins and 400-year-old Turkish monuments, which can be found side-by-side. Hungary has three major geographic regions (which are subdivided to seven smaller ones): the Great Alfold, lying east of the Danube River; the Transdanubia, a hilly region lying west of the Danube and extending to the Austrian foothills of the Alps; and the Northern Hills, which is a mountainous and hilly country beyond the northern boundary of the Great Hungarian Plain. Hungary has 10 national parks, 145 minor nature reserves and 35 landscape protection areas. This list includes national parks only. The Aggtelek and Hortobágy National Parks are also UNESCO World Heritage Sites. Aggtelek National Park, in Northern Hungary, in the Aggtelek karst region was founded in 1985. It has been part of the World Heritage since 1995. 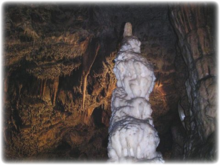 The largest stalactite cave of Europe is situated in this area: the Baradla cave (16 miles long, of which 5 miles is in Slovakia, known under the name of Domica). Hortobágy is a village in Hajd ú -Bihar county in Hungary. It is Hungary's largest protected area, and the biggest grassland that remained in Central Europe. It is similar to a steppe, a grassy plain with cattle, sheep, oxen, horses, tended by herdsmen, and it provides habitat for various different species (342 bird species have been registered to appear). Its emblematic sight is the Nine-holed Bridge, and this is the place for traditional sweep wells. Visitors might find mirages as well here. Bird watchers will love this park as it preserves rare bird species such as the Pygmy Cormorant, Squacco Heron, Spoonbill, Glossy Ibis, Ferruginous Duck, Long-legged Buzzard, Red-footed Falcon, Great Bustard and Aquatic Warbler, to name just a few. Lake Ferto is the second largest steppe lake in Central Europe, straddling the Austrian-Hungarian border. The lake covers 120 sq. miles of which 29 sq. miles are on the Hungarian side. Most of the lake is surrounded by reeds which serve as a habitat for wildlife (making the lake an important resting place for migratory birds) and are harvested in winter as soon as the ice is solid enough. These diverse habitats provide home to many sought-after bird species. Egrets and herons are found in good numbers, and Garganey, Red-crested Pochard and Ferruginous Duck breeds around the lake. Saker Falcon and Imperial Eagle have their westernmost breeding area here and the magnificent Great Bustard also survives. Although there are no "dramatic elevations" both the surface and the material of the Hungarian hills are amazingly differ from region to region thus creating very diverse habitats for vegetation and wildlife. The Countrywide Blue Tour is a part of the Hungarian section of the European Long Distance Walking Route E4. It starts on the top of the Irottko Mountain (884m), which stands on the Austrian-Hungarian boundary, and leads through the whole country until village Hollohaza at the Hungarian-Slovakian boundary. The Blue Tour visits some of the most beautiful natural and built sights of Hungary, for example dosen forts and castles, lookout towers, three World Heritage Sites of Hungary (the panorama of Budapest from the hills, the old village of Holloko and the Stalactite Cave of Aggtelek), Lake Balaton, the Danube Bend, the spent volcanoes of the Basin of Tapolca, etc. The number of the people, who have completed the tour, exceeded 4,100 in 2007. Mátra Mountains: 40 mile, 8,136ft climb: the highest mountains in Hungary. The Blue Tour climbs the two highest peaks: the Galyateto (964 m) and the Kékesteto (1014m). After the peaks the Tour descends on the long eastern ridge of the mountains until it comes to the villages Sirok and Szarvasko. Pilis Mountains and Mountains of Buda: The Pilis Mountains lie in the big bend of the Danube, where it turns towards southern direction from the earlier western-eastern direction. First the Tour goes in a southern direction until the area around Budapest, but it only touches the forests of the capital (Mountains of Buda), later the path goes back to the Pilis Mountains, and reaches the Danube at the Danube Bend at the village Visegrád. 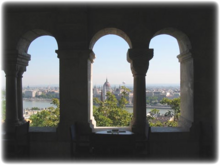 Some of the most popular Hungarian tourist sites are the Danube Bend and the Castle of Visegrád. Bükk Mountains and the Hilly Country of Aggtelek: The path climbs the 800-900m high plateau of the Bukk Mountains, then afterwards descends into the Valley of the Sajo River. Later the Tour visits the stalactite cave of Aggtelek in the Hilly Coutry of Aggtelek and reaches the Valley of Bodva River. 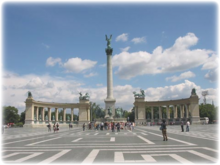 A popular tour is the cycle ride from Budapest to Vienna, in Austria. 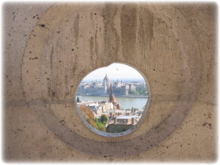 Give yourself time to explore the city of Budapest and don't miss the great thermal spas there. 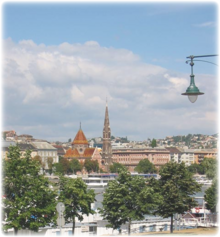 Then ride the Danube to Visegrad - a cyclepath starts at Batthyany Square in Budapest and follows the Danube past the famous Bend and through the Borzsony Hills. At Visegrád, check out the castle in the clouds. 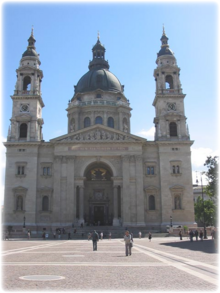 Next ride on to Esztergom continuing along the Danube, making sure to check out the amazing basilica on the hilltop of KÃ¡lvÃ¡ria hill. Next, on to Tata - this portion has some hard peddling but it is a nice stretch as you head through forests and don't have hardly any traffic to deal with. Tata is a rewarding destination - the town of waters (lakes), with a lovely atmosphere. As you continue on to Vienna, head through Pannonhalma along smaller roads in the countryside, through Gyor (a historical royal town where 3 rivers come together) and then to Rojtokmuzsaj (cycling past lake Ferto). Sopron, a town on the side of Lake Ferto, is near a great cultural landscape - large grasslands and colorful meadows. Sopron is near the Austria-Hungary border. This area is also great wine country. At the border, cycle or take the train to Vienna, 43 miles away.